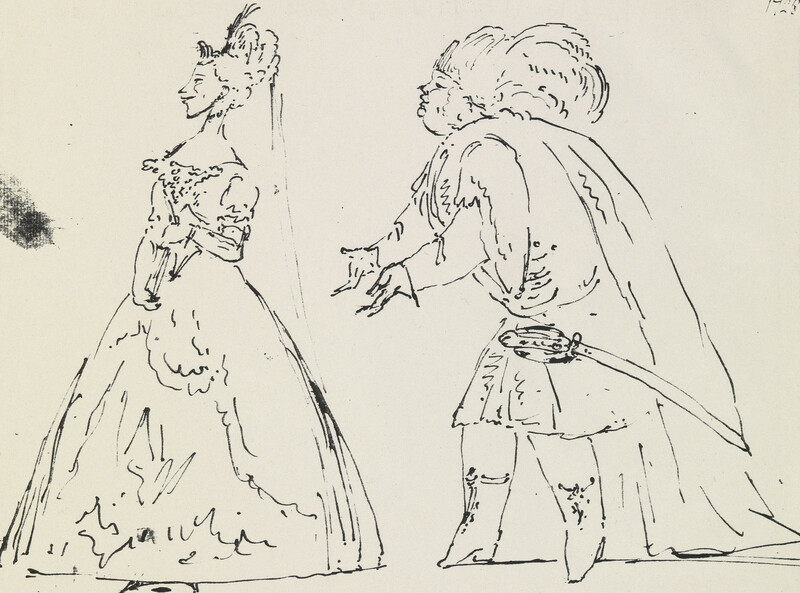 A pen and ink caricature of two singers in costume. A male singer in Oriental costume imploring a female singer, who faces away. Dated at the upper right corner, 1728. The singers in this drawing were identified by Enrico Lucchese in 2015 as the castrato Nicola Grimaldi (1673-1732), known as 'Nicolino', and the soprano Lucia Facchinelli known as 'La Becheretta'. Both singers performed in Leonardo Lalli's Argeno at the theatre of San Grisostomo in 1728, where Joseph Smith kept a box. Grimaldi is in the costume of the Chinese Emperor Argeno, with Facchinelli as his daughter.